How to prepare for an interview ? In this age, technology is taking lead in every sector. Youth is getting immensely attracted towards the technology sector. 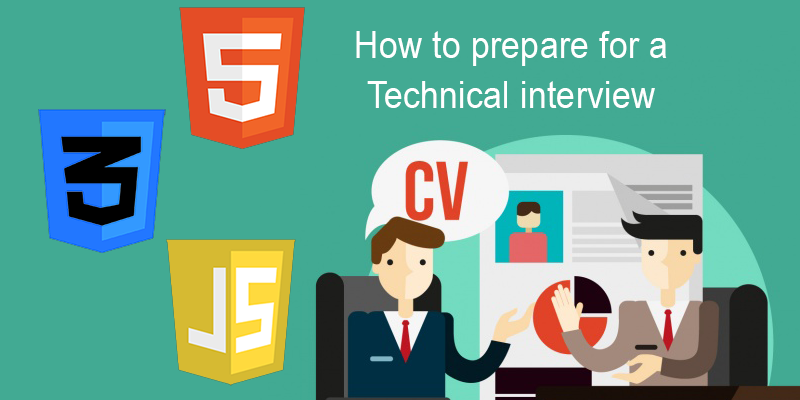 To get into the technical sector, you need to qualify the interview. It can be thought that people can only crack the interview during the actual interview. Of course, the time you spend with the interviewer is extremely important but people who stand out of the crowd are the people who prepare the best. The interview can be the most cherish or the most dreaded experience of your life depending on your interview preparation. It can be quite confusing on how to prepare for the interview; this article is written to help you a little in your interview preparation. Update your CV-CV is a document that you take with you in the interview room having all your relevant information. It is one of the most important parts of you as this is one thing that remains with the interviewee once you leave the room. So, spend some time over your CV. Some things that you need to keep in mind while creating a CV are not to lie, keep it as simple as precise as possible and getting your CV reviewed. Online help- create a LinkedIn profile if you still haven’t done so. It will not only help you to format your CV but also it will open your profile to the world. If not one the other potential employer can easily get to you. Many interviewers put the CVs of the interviewees on LinkedIn to find any professional contact. Any professional contact is a great help to bag the job. Show some work- if you are applying for a web developer then you should present some code snippets of the projects you’ve worked in past. You having worked in past shows that you are passionate towards the work. In the case of web developer post, you might present an open source project that you worked on. This all only adds up to making your favorite for the job. Blogging- if you have time and can update it regularly then writing a blog is a very good option for anyone thinking to bag a job. Do specify the blog’s URL in your CV. This will leave a very good impression on your potential employer. More than that, employers often wish to know about the candidate they might hire. A blog gives them the extra information about the topic of your liking. Homework- knowing about the company that you aspire to be a part of is almost a prerequisite for a job. It is worst to interview a candidate who does not know about the company. Long hours to know about the history of the company are not required but a basic understanding of the way the company functions and the culture of the company are expected. It is a sudden turn off if you have no idea of the company. Technical- many companies that are hiring you for any technical post might require you to clear a technical round. This technical round might have a task for you to complete using the coding in the computer. This is a round that you should take special care because there might interrupt some errors when the final test is carried out. An error free code impresses the interviewer the most. How to prepare for php interview? As an experienced developer, you must have good experience in the above described points. experienced developers must be capable for write complex SQL Queries based on the project requirements. So that she/he will be good at wring SQL Joins, Stored Procedures, SQL Triggers etc. If you are using Apache server then you must lean how to handle .htaccess file and its http request alteration techniques. Project deployment is essential part of the web development, so that you must lean how to use CPanel or any control panel of the web hosting. Experience in Linux CLI tools will be helpful during the deployment or migration of a website into another host ( Not for ASP.net ). If you are a Project Manager, You must learn more thing than the above points. You must have good communication skill in English, Linux/Windows server handling experience. Knowledge of Agile methodology and experience project management tool like ASANA, Redmine etc. Amazon Web Service is very popular platform among the developers all over the world. Its good to have knowledge in AWS services like AWS S2, S3 , Lamda etc. Similar service are offered by Microsoft called Microsoft AZURE. Do you want to be a Good Developer ? If you are a fresher and don't have a job yet, then don't look at the salary of any companies. Instead, try to get a job first. You must make sure that company has good technical team. So that you can learn so much about the technology very quickly. NodeJs, AngualrJs, Reactjs are the fast growing technologies in web development areas, so that take the opportunity to lean this. Technical jobs around the globe are in high demand and hence you need to be well versed with the area you apply for. A good interview preparation is better than anything to increase your chances to get that job you aspire for.